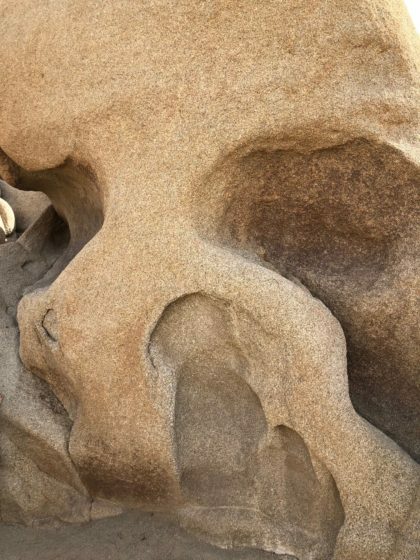 Visiting Joshua Tree National Park this Halloween weekend, it only seemed appropriate to walk through the Hall of Horrors and visit Skull Rock. Spooky during the daytime, but even spookier at night, especially on a full moon! Joshua Tree National Park is full of spooky shapes. There are crazy rock formations everywhere, like Jumbo Rocks and Wonderland of Rocks. In some campsites, you even camp tucked up against the rocks. Very cool! Even more amazing than the rocks are the Joshua trees themselves. Every one of them looks different. They begin life growing straight down with no branches, but at some point the growing tip is damaged and they flower and then branch off. Some are tall and thin – in fact, there is one tree in the park that grew some 30 feet before branching! It looks more like a tall palm tree than a Joshua tree. Others are full, like oak trees, and others only have a few branches at odd angles, casting a spooky shadow! Most surprising to us was to learn how slow they grow … only a couple inches a year. That means when you see a six foot tall tree, it could be over 50 years old!!! Most are even taller than this. 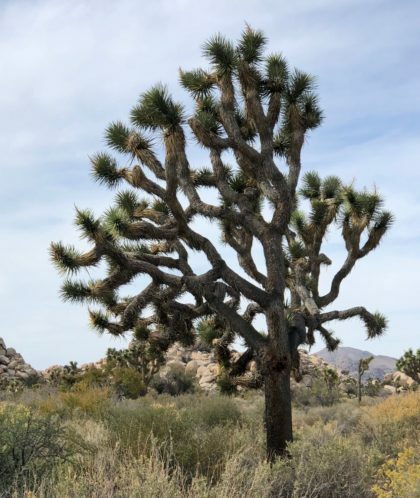 Another interesting fact that we learned from the rangers was that the Joshua trees growing in Joshua Tree National Park are different from those you see in Mojave National Preserve just to the north. There, the Joshua trees will look more alike because they have a gene that makes them branch more consistently. We had noticed this when we visited both national park units several years ago but didn’t know why. 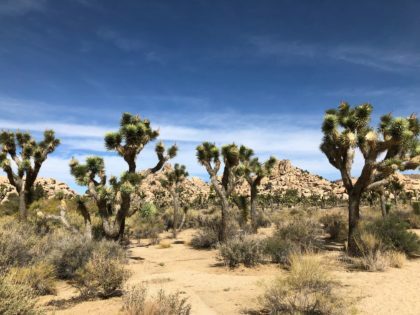 In fact, we thought there were more Joshua trees in Mojave National Preserve than there were in Joshua Tree National Park, but we were wrong! Our first visit, we drove in from the south entrance and we didn’t get as far as the northwestern part of the park. This time, we entered from the north from the town of Joshua Tree and it was a very different experience! There were Joshua trees as far as the eye could see. We highly encourage you to drive through the entire park. The scenery and vegetation and even the rock formations change wildly between the lower elevation and higher elevation. You might even find it best to enter the park from the south so that you can avoid the crowds and possible delays at the north entrance. Please obey the speed limit and watch for wildlife, especially desert tortoise. Each year more of these endangered creatures are lost to traffic. Watch for them on the road and check for them under your car, where they may be napping in the shade. But don’t pick up a turtle - ever! Their defense mechanism is to pee but doing this, they lose the water they need to survive. Picking up a desert tortoise for a selfie makes you a killer. Don’t do it! As you drive through the park, you will encounter a variety of landscapes. The park encompasses almost 800,000 acres of Mojave and Colorado desert. The higher elevations host piñon pine, scrub oak and juniper. As you drop down into the more arid desert, the vegetation moves to cactus, creosote bush, brittle bush and smoke trees. If you aren’t from the desert southwest, be sure to stop at the Ocotillo Patch and Cholla Cactus Garden. It is crazy how dense the chola cactus are; we’ve never seen so may cholla in one place! And, if you have never seen an ocotillo, you’ll love their crazy shapes. When it is dry, they look like a bunch of dead sticks but after a rain they’ll be covered in leaves. Hidden Valley: It’s only a mile loop trail, but it takes you into a natural paddock where cattle rustlers would hide out among the massive boulders. Barker Dam: Another short hike and there may or may not be water there, but it helps tell the story of how vitally important water rights were for early ranchers. They still are! 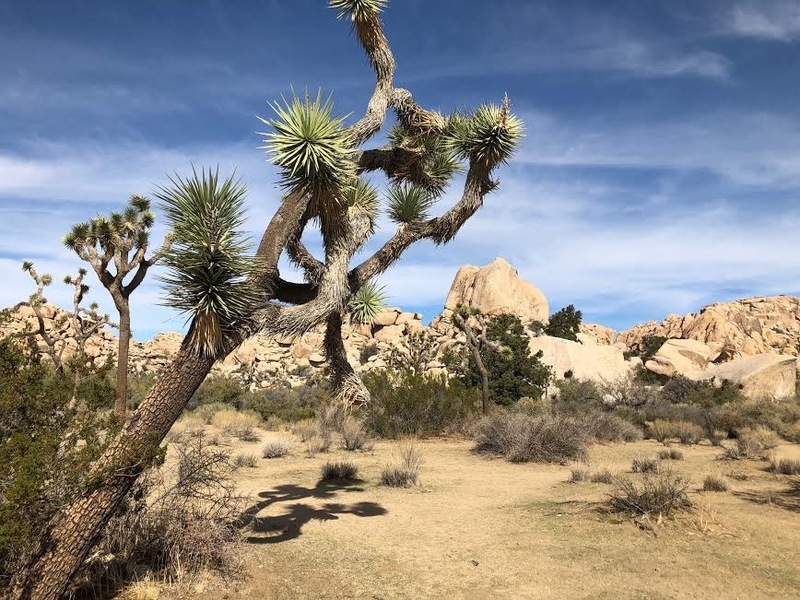 Wall Street: Starting from the Barker Dam trailhead, this is a bit longer trail through Joshua trees and along the Wonderland of Rocks.Here you will experience some of the mining history of the area – active through the mid 1960’s. There is lots of “rusty memorabilia” along the trail. Cottonwood Spring to Lot Palms Oasis: Take this one for a beautiful view of the Colorado desert and experience one of the five spring fed oases in the park. Hint: Go early. Trailhead parking fills up. This is the desert so spring or fall is best. You can expect hot hot in summer and pretty cool evenings in the winter months. We like the spring, especially if it has been a wet one. Then the wildflowers will be lovely. 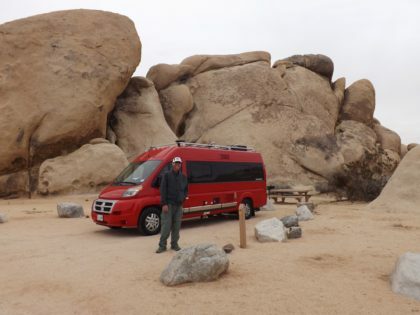 Recent years have seen a huge increase in visitation at Joshua Tree National Park. 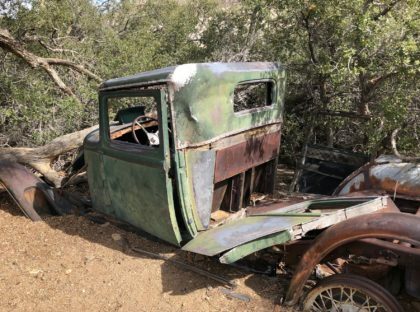 No one is sure why … maybe it was the National Park’s 100th birthday; might have been the 30th anniversary of U2’s Joshua Tree album; or perhaps it is a pilgrimage of Gram Parsons’ fans. Did you know this was his favorite place? He died just outside the park in a hotel in Joshua Tree in 1973. It was said he wanted to be cremated and have his ashes spread in the park, so when he died, some of his friends stole his body and took him into the park to cremate him. They weren’t quite successful and his partially burned body was found by park staff. Check out “Kaufman’s Koffin Kaper! It’s quite a Halloween story. Loved the blog and it was a pleasure meeting you both at the Cottonwood Visitor Center! Thank you for your conservation message about the Desert Tortoise!